The angle grinder can be one of the most utilized tools in your toolbelt. It comes in handy anytime you’re working with metal, wood, or plastic. If you find yourself hacking away on some PVC during a plumbing project or filing down a weld, it might be time for the angle grinder. Who is the Cordless Grinder For? What does the Cordless Angle Grinder Consist of? Battery Grinder with Brushless or Brush Motor? Battery Powered Angle Grinder. What type of disc? Our pick for the best cordless angle grinder is the ​Milwaukee 2680-20 M18 18V Lithium Ion 4 1/2 Inch Cordless Grinder. The Milwaukee grinder comes with Redlink Intelligence technology which extends the longevity of your grinder. Couple that with an outstanding customer support line and key safety features like the paddle switch and L shape exhaust vents. We feel this is the best choice for the consumer. The Milwaukee model comes with a paddle switch feature, which powers-on the grinder. When wearing gloves this feature gives you both safety and convenience. This grinder is compatible with M18 18v lithium batteries, so you’re not limited to specific power sources. With a 4-pole motor you’re going to be outputting maximum power when filing off a weld or cutting through pipe and wire. Another key feature is the overload protection. This prevents damage to your tool due to human error. 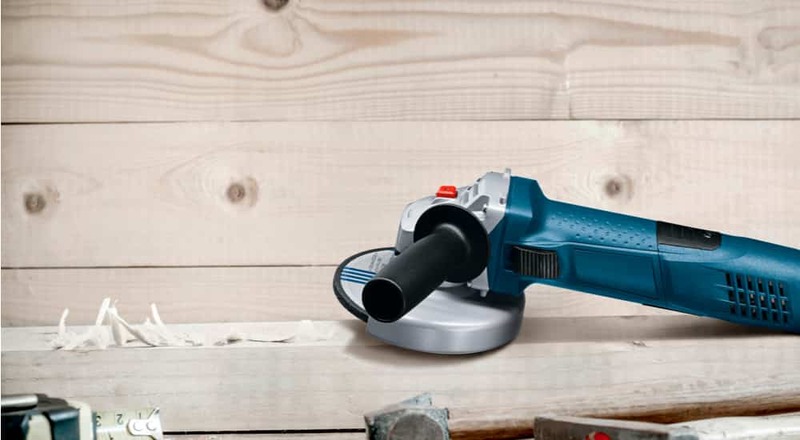 The Milwaukee grinder comes with a tool guard to protect you from projected debris. It is also adjustable to accommodate for different cutting angles. The grinder is also designed with L shaped exhaust vents to prevent any debris from entering the tool, which can cause malfunctions. The Milwaukee grinder expels an amazing degree of RPMs, 10,000. A lot of power in a handheld tool. With a 3-position handle you can cut at any angle with a secure hold. This is not only a key control feature but a safety one as well. A unique benefit specifically for Milwaukee tools is Redlink Intelligence. Redlink technology is designed to enhance and protect the performance of your battery and motor. Milwaukee products come with a 24/7 support line. With their warranty they provide 7-10 day repairs. The VonHaus grinder comes with an auxiliary handle which offers vibration reduction technology. It gives you smooth and comfortable control when grinding. Also, detachable and can be used on either side. This grinder comes with lithium battery support. With extensive use, this type of power source is preferred to extend battery life. The wheel diameter is larger in comparison to standard models. This helps you cut more robust pipes. The cast aluminum gear head reduces the overall weight of the tool, which gives you better control. The VonHaus grinder has exceptional power running up to 11,000 RPMS. An incredible amount of power compacted into a handheld tool. The grinder has one of the best safety features on the market. The two stage trigger safety feature prevents any false starts. Another eye-catching benefit is the 4.0AH battery with 100-minute charge time. The battery is also interchangeable with other VonHaus tools. Additional charge light indicator included on the charger. The VanHaus has a built in 115mm disc guard to protect you from various forms of projectiles. Additionally, the grinder has a diamond tipped disc for a long-lasting blade and comes with a storage bag. All VonHaus tools come with a standard 1-year warranty. You have the choice to extend your free warranty if preferred. The Ryobi P423 is truly light weight, giving you great control whether you’re grinding down a weld or cutting through PVC or metal pipe. Along with the light weight benefit it provides a 3-positioned grip for comfort and steadiness. This grinder has an onboard spanner wrench, so you won’t have to hunt down the tool every time you have to change the disc. 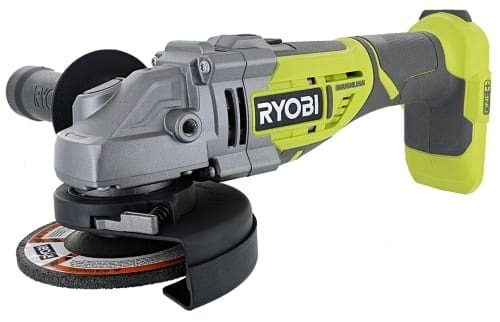 In the case in which you’ll need to adjust the guard for a deeper cut, the Ryobi grinder gives you the ability to do that with a push of a button. The Ryobi has tremendous power with up to 10,400 RPMs (no-load), perfect for a multitude of different uses. The grinder comes with grip zone overmold which gives you great handle even when wet. Ryobi comes with a 3-year warranty and a customer line for questions. They also provide replacement parts upon request. Along with the customer support help every grinder comes with an owner’s manual to assist with assembly. The Ryobi grinder supports 18 volt lithium batteries for long lasting runtimes and reliable power. The Bosch angle grinder comes with a two-handle vibration setting. Both optimal for reducing vibration and improving fatigue during sessions. The tool comes with exceptional runtime, backed-up by Bosch’s electronic cell protection and electronic motor protection. The technology reduces the frequency of brush changes. Along with the electronic motor protection, the grinder is architected with a four-brush motor design enabling to have unbelievable grinding clout. The Bosch motor is up-to-par with competitors with a zero load 10,000 RPM power get up. Perfect for all day projects. The lithium battery power is next level thanks to Bosh’s flexible power system. They offer two battery platforms, flatpack or slimpack. Along with the battery technology Bosch’s batteries come with cooling technology which gives them 2x the life. Couple that with the ability to work in the coolest of garages, down to -4-degrees Fahrenheit. One of the most time-saving benefits of using a Bosch is the no-tool quick change. The wheel guard is designed to detach with ease. The grinder is also equipped with burst-resistant technology as an additional safety feature. The Bosch line is backed up with a 3-year tool protection warranty and a 2-year battery protection plan. Additionally, they’ve established a 1-call resolution hotline. The Dewalt 20 volt max is equipped with a two finger activation, which helps prevent accidental fire ups. The grinder comes with larger battery capacity for longer runtime. The quick-change wheel release gives you little down time between wheel changes. No need to hunt down a tool around the workbench with the no tool quick change. The 2-position handles are optimal for finding the right angle to take and while maximizing stamina. The Dewalt grinder comes with an 8,000 RPM motor, durable enough to handle routine jobs at the jobsite or in the garage. Along with the tool-free wheel release, the grinder comes with a tool-free guard release as well for convenience. The grinder has one of the lightest weights on the market, which helps tired hands hold on a little longer. The Dewalt line comes with one of the best warranties on the market. 90-day money back, 3 year protection plan, and 1-year free service. The angle grinder is one of the most versatile tools in production. With this tool you can cut, grind, sharpen, clean, and sand objects. Furthermore, it gains more flexibility when you remove the factor of being tethered to an outlet. Now, you can take this powerful tool anywhere, you can cut at virtually any angle without restrictions. So, how do you know if you’re ready for a cordless angle grinder? The angle grinder is utilized for many household projects. If you’ve ever been tasked with a plug and chug plumbing project, you’ve found yourself cutting pipe. When the time comes you find yourself reaching for a tool. If you don’t have an angle grinder you’re going to be using a hand saw, or a circular saw. However, the circular saw is only useful if the pipe is disconnected. In this situation a cordless angle grinder comes to the rescue. Perhaps, you decided to embark on the endeavor of a welding project. You’ve successfully mended the objects together, but you’re not the most aesthetically pleasing welder and you need to smooth the weld off. An angle grinder is perfect for the task. The angle grinder is for anyone who rolls up their sleeves and tackles various projects around the house. In whole, the tool breaks down into a few main components. Listed below are some key parts all angle grinders have in common. Disc- The disc can also be referred to as a blade depending on what the use is for. There are many types of disc, but essentially the disc is the wheel shaped object which does the cutting, grinding, sanding like a benchtop belt sander, etc. Battery - All cordless angle grinders must have a power source. Batteries come in different sizes and power. Some manufacturers invest in battery technology to give their cordless power tools longer runtimes. Motor – The motor is the heart of the tool, but not all power tools have the same type of motor. There are brushless motors and brushed motors. Both have pros and cons. Disc Guard – Most newer style angle grinders come with a disc guard. This essential safety features not only protects you from debris but also keeps wayward fingers from the spinning disc. When browsing through pages of angle grinders, you might be scratching your head. They all have a set of unique features, yet they all have common items. Here are some things to consider to find out which one is right for you. If you don’t anticipate daily use of this tool and every so often you need to sand down a few items, maybe less is more. A lightweight grinder will do the trick for some rough edges that need to be buffed out or simple pipe cutting. However, if you’re depending on tackling some heavier projects with frequent use, the bulky grinder with some power to it, is going to get the job done. When it comes to using an angle grinder, control is crucial. If it is a delicate piece of wood you’re sanding or unexpected kickback you need a handle on this powerful tool. Look for the grinder that has the grip options you think we’ll give you surgeon-like control. Not all batteries are equal based off there voltage output. If you’re seeking to work hours at a time, consider finding a cordless grinder that accepts lithium style batteries. Some brands build into the tool technology that enhances the life of your battery. This is all about preference. If you’re a person who has a tidy workplace always knows where every tool is, this is not as important. However, if your idea of organizations is a drawer full of scattered tools, a no-tool changing feature is for you. Angle Grinders will need wheel disc changes per job, or extended use. Having a tool on board or a button release mechanism is a headache saver. When it comes to deciding on a grinder (or power tools in general) there are manufacturers who stand by the claim that brushless motors are the smarter technology. In a nutshell, the brushless motor has the ability to wind up or down based on use. This way you’re not running max RPMs once you flip the on-switch. In contrast, the brush motors essentially have one speed, go. Once you turn the switch on, it’s max RPMs. This is something to think about with any power tool, each case is different, and with grinder there might not be a huge difference. The angle grinder operates with different types of disc. Each disc is designed for specific uses. Here are some of the disc you’ll be able to use with your angle grinder. The grit disc would be the standard disc, which comes with the grinder. It’s used to cut through various material such as metal or plastic. This disc is engineered for long lasting use. It’s outer edges is coated with traces of diamond to cut through touch metals and slow the wearing process. The wire wheel has the unique ability to polish and built up rust. It’s made up of what it sounds like, metal wire. The wood disc is used for cutting into wood. This special type of disc helps prevent friction and reduce the heat. Like any power tool safety is of the utmost importance. Although, when it comes to any tool with a blade you need to be extra cautious. Let’s go through a list of precautions to be aware of before you flip that on that power switch. Before you fire-up the grinder it’s important to review the owner’s manual. The manual is able to provide you with detailed instructions on proper assembly, which helps you understand every faucet of your tool. It’s important to wear the proper safety gear. Glasses are a must when working with a tool that will likely fling projectiles throughout the workplace. Additionally, wearing gloves is smart when working with metal. Clear the workspace. If you’re working in a garage (which most of us do) it’s crucial to clean up any fuel spills and put away any combustible liquids or materials. 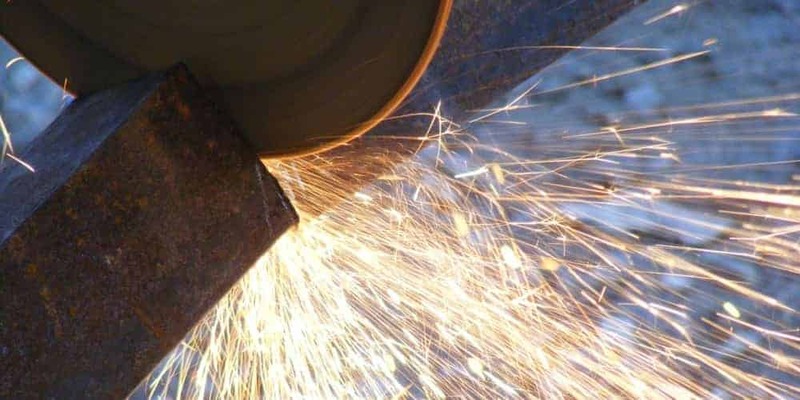 When grinding or cutting metal, sparks will fly everywhere. To be extra cautious working in the driveway might be the safest option however, take into consideration wind and your lawn. Always know what you’re cutting into. Make sure when cutting random pipe to inspect and find out what kind it is. You don’t want to be cutting into any gas pipes by accident. Make sure to use your wheel guard. Sometimes you might be tempted to remove the wheel guard, but don’t. This is there for your protection and safety. If you have any questions on how to use your grinder check the manufacturer. Most have a hotline or website instructional video. Never let a child operate this tool. For your angle grinder to run at full capacity you’ll need to give it proper care and maintenance. Here are some ways you can do that. Clean it - Because the angle grinder is so versatile you can use it on a lot of different material. Make sure to clear it of dust or excess moisture after every use. A good wipe down with a clean cloth ought to do the trick. Charge Battery – This one might go without saying, but how many times have you started to use a power tool only to find you’re low on battery. A good practice is to put it on charge after every use. Check Disc Size – Each grinder is made to accommodate for various disc sizes. Make sure the disc size you purchased fits your grinder. Be Safe – Avoid pushing your grinder to the max. If you feel your tool getting hot, put it down and let it cool. If the disc is wearing down or it’s taking longer to grind an object, instead of pushing it harder to work, change the disc. Storage- Store your tool in the original box it came in or a designated drawer. Store it where it’s out of the elements and where children can not reach it. This will prevent unnecessary damage to the grinder. To improve each runtime, have two charged batteries onsite. If possible purchase lithium batteries, which enhance the battery life by up to 2x. Note, not all grinders come with batteries and will need to be ordered in advance. Additionally, working with a fresh disc will provide optimal use. Also, review the different types of disc you’ll be using and order them ahead of time. As mentioned above not all disc are used for the same jobs. Before you start your project run through this essential checklist. Choose correct disc for the job. Make sure batteries are charged. Q: How to use a cordless angle grinder? A: The proper steps to use an angle grinder are as follows. Review owner’s manual, assemble, apply proper safety gear, and power-own. You want to adjust your grips according to comfort and then proceed to use. Q: Can an angle grinder cut concrete? A: Yes, but you will need a cordless angle grinder with efficient power. Additionally, you’ll need to use the proper disc for cutting concrete. Remember to wear the proper safety gear when cutting through rock. Q: Can an angle grinder cut wood? A: Yes, you can. However, it’s not always recommended. When cutting through wood the disc on wood combo will cause friction and can start a small fire. There are wood disc available, but a circular saw would be a better fit for cutting this material. Q: Can an angle grinder be used as a sander? A: Yes, this is one of the primary uses for the tool. You can install a flap disc which is designed to sand when installed on an angle grinder. Q: How to change the angle grinder disc? A: Each make, and model is different. Some grinders come with a no-tool quick change, where you can simply push a button to change the disc. Others will need a small wrench or tool to loosen the nut which holds the disc in place. Q: Why variable speed angle grinder? A: Having a variable speed grinder gives you control over the RPMs. Sometimes it’s easier not to have the grinder running at max RPMs during every use. The variable speed grinder gives you the luxury to choose and save battery power. We feel the Milwaukee 2680-20 M18 18V Lithium Ion 4 1/2 Inch Cordless Grinder is the best choice for the consumer. The Milwaukee grinder has three grip adjustments and a paddle switch activation for optimal comfort. It also provides Redline Intelligence to enhance the relationship between the motor and battery. To drive it home Milwaukee comes with a great warranty and exceptional customer service. ​However, if budget is the main driver the VonHaus 20V MAX Cordless 4 1/2” Angle Grinder is a solid option. It comes with auxiliary handle technology to reduce vibration when in use. Also, it has efficient power to handle daunting projects. If you’d like to settle in the middle the Ryobi P423 18V One+ Brushless 4-1/2" 10,400 RPM Grinder is a good pick. Ryobi has the option to use lithium batteries and is equipped with a brushless motor system.